Bowen, Fred. Go for the Goal. Josh and Aidan are very excited about making a travel soccer team, the United. They've both played for years with the Flames, and knew all of those kids well, so it's a bit of an adjustment. The team has a great coach, but still is losing a lot of their games. When the boys have a research project for school, they pick the World Cup to investigate, and their teacher suggests they find out more about the 1999 women's team who went on to win. They find out that the team did a lot of team building exercises. Feeling that anything might help, they ask their coach if it would be okay to try. The boys start with a "stuck on a raft" exercise on a blanket, where the whole team must stand on a blanket and move it a distance, and go on to zip lining with the team. The United ends up working better together, getting along, and finally, winning more games. Strengths: Remember, I am always biased in favor of Bowen because he wrote Hardcourt Comeback and used our head cross country coach as a character in it, which was SUCH fun. What I love about Bowen's work is that he ties in the team's action to a historic event, such as the 1999 women's championship team. There's plenty of action, a few interpersonal problems, even scores and rosters, but I like the historical notes at the end. Fans of Matt Christopher adore these. Weaknesses: In paperback. Boo. The covers are not always very good. Joey Jordan spends the vast majority of her time practicing gymnastics, just like her older sister Julia did before she retired. Her best friend Trish has trained with her since they were tiny, but things are changing. Trish's ankle has been giving her trouble, and as the girls enter high school, Trish is more interested in boys than in practicing nonstop. Joey is interested in Tanner, with whom she had been friends and who has moved back to town. He is interested in her, but when he wants to walk her home from practice and get a milk shake, she freaks-- she doesn't have time to spend with him, and Julia warns her that "boy drama" will slow her down. Joey tells Tanner she can't really hang out with him until after regionals, because she DOES spend a lot of time thinking about him. The assistant coach agrees with Joey that floor routine the head coach wants her to do is boring, so the two work on a jazzy number that Joey really enjoys. She wants to win the national championship like her older sister did, but has to make a choice-- does she want to devote all of her thought and energy to gymnastics, or does she want to have a regular teenage life? Strengths: Finally! 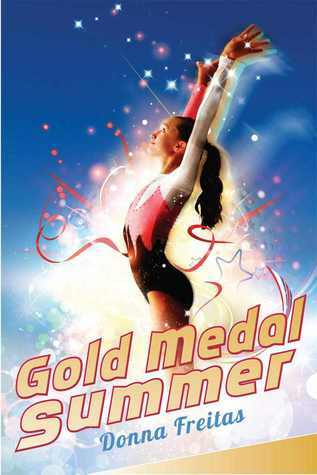 A great book about gymnastics! It is very apparent that Freitas knows her stuff-- the descriptions of events are fantastic. The pull between the drive to succeed and being interested in a boy will make this story relevant to girls who are not into gymnastics as well. Weaknesses: There were a lot of girls in my middle school who did gymnastics, but I don't seem to have any students who participate. It's more soccer now. Still, a great story!